Tim Williams sought more information on 'Gentleman in a Rickshaw' at Southend Museums Service. Southend Museums Service has been unable to read the signature apart from the initials: 'V. 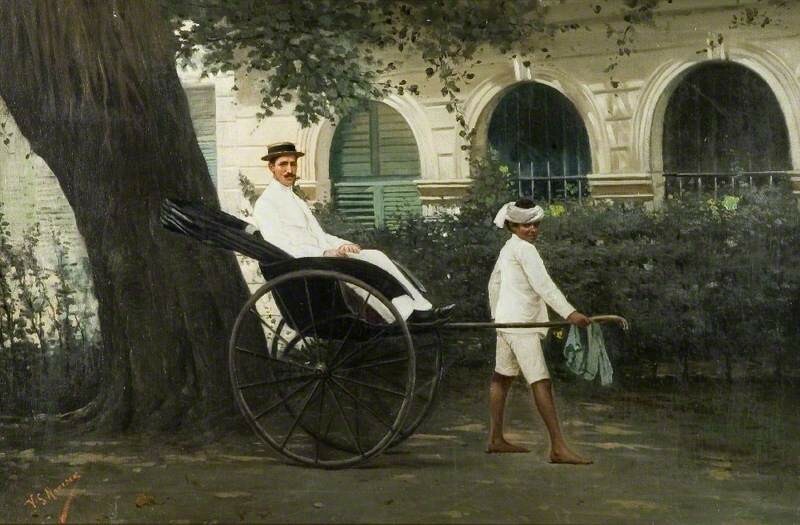 G. M.' Tim thought the painting probably depicts a scene in Ceylon/Sri Lanka: ‘the rickshaw was introduced to India in 1880 and Sri Lanka a year or so before’. Art Detectives soon found two other paintings likely to be by the same family of artists, if not by the artist: a portrait by a ‘V. G. Marrson’ at National Museums Liverpool and a posthumous clerical portrait attributed to ‘Marescar’ at Blairs Museum. Interstingly, both of these works look as though they could have been painted from photographs. Osmund Bullock thought probably a few paintings on auction lot websites were probably by the same Maresca(s): presumably a family of painters producing works for the Italian tourist trade. ‘Maresca’ is a name common to Naples and Campania. Interestingly, in the late nineteenth and early twentieth centuries, passenger ships sailing from Ceylon to England routinely stopped at Naples. Tim asked whether we were sure of the 1880 date: the rickshaw indicated the painting could not be depicting a scene before about 1880, but the gentleman's style could easily be up to the First World War. Art Detectives were set on Ceylon/Sri Lanka being the location rather than India.